Appearance: it is akatana with a hilt that is 25 Cm long and a blade that 2ft 14 cm long when not expanded. 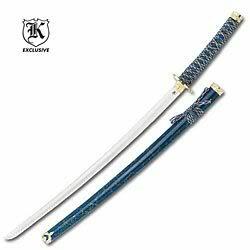 The hilt of the katana is metal with a light blue ribbon wrapped around so that in the middle there are little diamonds. the blade itself is pure black. when Junko has it on her back she keeps the blade in a sheath that is the same color of the ribbon. the blade is slightly curved. History:Junko's mother taught her how to use swords and junko loved them so much that one day she learned that she would make one using her metal element. she stayed up day and night perfecting the design as well making the sword itself. She then practiced by herself to use it. 1) What is the maximum length? 2) How do you control it in air, give an example please. okay 4 and a half feet right(maximum)? What is the original length? How does she control it? Does she makes it float, if so how far away can it be from her hand(s)? I know it is with her metal element but I'm asking does it float? And if it does how far away can it be from her hand? That's 11 feet of range. I am willing to make it one foot range the longest. That means you can give an extra thrust while making it longer giving you a sneek attack. And while constanntly changong length and range from your hand you can keep your enemy on their toes. You can make the six feet thing a spell if you want but as of now your weapon is approved.